As the seasons change many women love to show their love of the current season by purchasing some fashion jewelry to reflect the current season or upcoming holidays within that season. Here are some jewelry ideas to help you show off your love of the 2012 New Year and Winter Season this year. * Purchase some Seasonal Brooches and Pins to reflect the winter season such as snowflakes, snowmen, ice skates, winter skis, snow covered pine trees, etc. If you are into florals you can purchase holly and berries, evergreen trees & wreaths or go with sparkling crystals in bright jewel tones. There is beautiful seasonal jewelry available that is classic and stylish and you can also find fun, quirky jewelry pieces as well. * Purchase a charm bracelet and add some cute seasonal and special occasion charms to reflect the season and place them onto the charm bracelet. This is a fun idea because there are so many gret types of charm bracelets available now like the Pandora Style or the traditional dangling charms. Also necklaces with a charm holder loop are a fun way to wear these items too. Pins, Brooches and Charm Bracelets are some of the easiest ways for you to wear seasonal jewelry this winter season. You can go small just by purchasing a few pins or go big by purchasing an entire wardrobe of seasonal jewelry. Have some fun with bright colors and whimsy or keep it beautiful and classic with silver, gold or platinum with plenty of crystals or diamond sparkle. However you like to wear your favorite jewelry, you will look fabulous! Enjoy the winter season and New Year! by Kaye Lefier, Contributing Editor at ChasingTreasure.com, online store specializing in wooden jewelry boxes and leather jewelry cases. Kaye is an avid Jewelry Collector and writes about Jewelry and Jewelry Trends. The Blue Topaz is a gorgeous stone that has been revered for centuries. The Topaz is a mineral that is found in Europe, South America, Japan, Mexico and the United States as well as other parts of the world. It comes in many different colors and a few have formed into giant crystal boulders that you can see in some museums. There are very rare Topaz stones that have been mined and cut into massive personal stones like the Topaz of Aurungzebe that measured 157.75 carats and the American Golden Topaz, a more recent get that measured a massive 22,892.5 carats. Most jewelers and consumers consider the London Blue Topaz to be the most desirable and valuable out of the three gemstone hues. It is also rarer so you will find more Sky blue and Swiss blue stones in the marketplace. Being able to access the Sky and Swiss stones also keeps the stone more affordable for everyday use. Topaz is a beautiful stone and the clear color makes for a beautiful piece of jewelry. When looking for gifting ideas for December birthdays you will find lovely drop earrings or large cut stone studs that look amazing. Also the Topaz looks fabulous in a pendant or pin and will take an outfit from pretty to stunning. Also great for the December Topaz babies are some stunning large cocktail rings that show off the dramatic cut of the stone. Surround it with some clear crystals or diamonds and you have an amazing ring. Pair it with a matching bracelet and you will look like you spent a million bucks! Topaz is a beautiful choice for the jewelry lover and it looks amazing set in silver or gold. The ranges of colors available make it an affordable gemstone that anyone can enjoy. by Gregg Nosaji, Contributing Editor for ChasingTreasure.com, online retailer of jewelry boxes, jewelry armoires and jewelry related gifts. Gregg is an event consultant and writes about gift ideas and special occasions. It can be difficult choosing a great gift for a man. Here is a great idea for the watch collector in your life! During the holiday season you will see a lot of nice deals, specials and sales on a large variety of men's watch storage boxes and watch jewelry boxes. This is the perfect time of year to pick up a few of them for upcoming holiday and birthday gifts for the remainder of the shopping season. 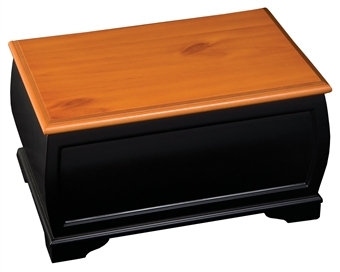 Watch collector storage boxes come in a large variety of colors, numerous sizes and shapes and you can get them made from a variety of materials and fabrications like burl wood, maple, teak and leather. Some of the most popular ones are the classic styled boxes that simply come in colored faux or real leather. Some men like having a clear-view window top on the watch storage boxes so that they can easily see the inside contents and other men prefer a solid top so the valuable watches aren't exposed to guests and housekeepers etc. The choice is simply left up to the user or the buyer. If you are looking to purchase a keepsake style men's watch storage box as a gift, a thoughtful idea is to have his initials debossed into the leather or engraved on a nameplate that can be attached to a wood box. To make this a special gift for your loved one, purchase a nice watch he has been admiring to go along with your box and present the gift inside the box to surprise your man with two gifts in one! With our great selection of men's watch boxes at Chasing Treasure, you are sure to find the perfect box that will make a great impression and create a lasting memory for the favorite man in your life. Every little girl loves jewelry and dressing up. And these little girls also love receiving jewelry from their parents and loved ones during the holiday season or for any special occasion. You can make a lasting impression on a special girl this holiday season by presenting your special jewelry gift in a beautiful jewelry box. There are many different themes and designs available like the ever popular Musical Ballerina or Butterfly Sleigh that we have available. Once you have selected the perfect jewelry box, a few beautiful pieces of jewelry to go inside add to excitement of the gift. Matching the theme of the jewelry to the jewelry box is a great idea for younger girls. Presenting your jewelry gift inside the new jewelry box is exciting and great fun for your little girl. Imagine the look on her face when she pulls out piece after piece of lovely matching jewelry from her beautiful jewelry box. She will be the envy of all her friends. 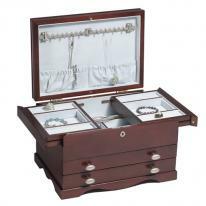 What great memories you can instill in her with a lovingly selected jewelry box. Jewelry boxes create memories that last a lifetime. Be a part of that with your thoughtful gift this Christmas or anytime you need a special gift that is just right. It can be really hard to choose the perfect gift for your new husband or wife that will make an impact, have meaning and create lasting memories. Traditionally, many of the brides and grooms consider the gift of jewelry the special gift given between those newly married. 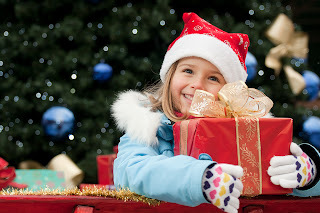 Now many newlyweds look for other special gifts to be give for the first Christmas together. One great item that is often chosen by the new husband for his new wife is a beautiful wooden jewelry box with an engraved name plate dated with the year of their first holiday together. This box will be something that will last a lifetime and be a treasured keepsake. His wife can fill it with beautiful jewelry collected over the years of their marriage and include special mementos too. Another thoughtful gift for a new wife, is a leather jewelry travel case that she can use to take her special jewelry in on vacations or business trips. Travel cases can also be engraved with names or special thoughts and endearments to add meaning to the gift. In return, the new wife looking for a handsome and meaningful gift for her new husband can select a men's leather or wooden valet box to hold his jewelry or every day accessories. Both of these items are able to be engraved with the holiday date and a special message. Another wonderful and thoughtful gift for your new husband would be a wooden or leather watch case to hold his favorite watch or watch collection. It is a gift that will make a lasting impression and the new husband will be thrilled with the thoughtfulness of such a gift, especially if it is personalized with his monogram or a heart felt message. Looking for that special holiday gift for the first Christmas together can be a stressful task if you let it be, but selecting a treasured gift like a wooden or leather jewelry box, valet box or watch case can add the perfect element to the occasion. Choose to make your first Christmas together memorable and perfect with jewelry box gifts that last a lifetime. Glam It Up! Earring Trends for the Holiday Season. The Glam It Up! Earring Trend is bigger than ever before and this year we are seeing the ladies really going glitzy and glamorous with their holiday jewelry choices. With all of those wonderful holiday parties that will be on the schedule, now is the time to check out the beautiful choices! 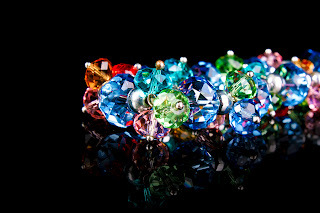 If genuine gemstones are out of your budget this season then look for faux gemstones and rhinestone jewelry. They are just as sparkling and beautiful. Here are some tips on the choices you have to look forward to. * When looking for dangling gemstone holiday earrings, look for earrings that are multi-tiered as well as ones that have multiple gems. We are seeing a lot of three-station dangling earrings this season in a variety of shapes, sizes and colors. * Looking for an earring choice that is glamorous but not over-the-top? Try a gemstone or rhinestone drop earring that is 1 1/4" to 1 1/2" in length. Perfect for any casual or dressy style. * If you are seeking classic glamorous style, you can select a 1" diameter button style earring that is encrusted with real or faux gemstones. For the classic look...go for clear and for an updated modern look...go for colored stones. When thinking about this style...imagine sitting in your grandmother's bedroom and digging through her jewelry box. Those are the type of earrings we are seeing this season! * If you are a romantic then look for dangling heart shaped earrings that are encrusted with real or faux gemstones. * Pearls re a classic and always in style! This year instead of sporting a simple stud earring, glam it up with a button style pearl earring that is encrusted with genuine or faux diamonds or other gemstones. Whatever style you choose, you will look beautiful in your glamorous choices and attend your holiday parties in unparalleled style. The Christmas season is one of the top buying periods for gifts and jewelry boxes are a favorite gift item to buy and to receive! With all of the choices available, we thought it would help if you had some tips to look for when buying the right jewelry box or watch box for your loved one. So in no particular order, here are 4 things to look for with your next jewelry box purchase. 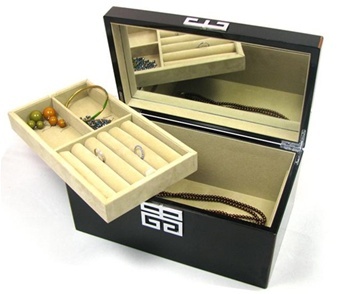 You want to look for a solid jewelry box that is made from quality materials such as wood. Wood will last a lifetime and it comes in a variety of styles and finishes. The wood can be stained in a variety of colors to match personal taste and decor. A jewelry box should protect your jewelry investments so make sure it is professionally lined in a soft material such as velvet or suede. The lining should be checked every few month for stains or tears. Look to make sure all the trays, drawers and storage areas of the jewelry box are lined. Tip #3 - Organizing Features: A great jewelry box will always feature classic organizers such as padded ring rolls, earring compartments, necklace storage and watch pillows. Some will have open storage for larger pieces such as bangles or over-sized pendants. For some people, the more organizers and divided storage is better and for others less is more. 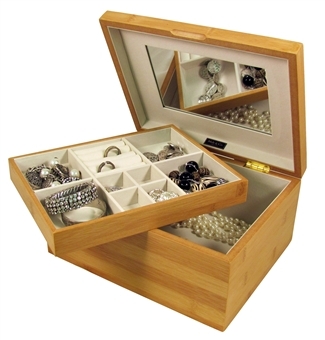 Tip #4 Price Point: There is a large range of pricing for jewelry boxes. Generally speaking, floor models will cost more than dresser top boxes but it is not always the larger jewelry boxes that cost more. When shopping for the best value, look for quality craftsmanship such as mitered corners, quadrant hinges and solid lids. Choose a trusted brand and you'll find value. Overall, if you pay a bit more for good, solid craftsmanship you will be pleased with your choice and can count on the jewelry box being handed down to future generations. Most women have been dreaming about their wedding since they were little girls. They know what they will wear; the style of the dress, the veil and the beautiful jewelry that will adorn them for the finishing touch. After dreaming of the perfect wedding all of their young lives, many women still want to be a classic bride. Selecting a classic style in the dress and also pairing it with beautiful pearl jewels will always be the right choice. Selecting the right pearl length necklace for your dress will, of course, depend on the style of your dress and the neckline. Here is a guide that will help you find the right length to compliment your dress. Choker: Usually a single strand of pearls that lay tight on your neck or collar. Great for higher neckline dresses. Collar: This is made of three or more strands that fit securely around the neck lying at your collar line. This beautiful style looks lovely with a plunging neckline. Princess: This length falls below the hollow of the throat. You can find pearl necklaces in multi-layers in this length if you need a bit more definition to the pairing. Matinee: This size hits the top your chest and looks great with a boatneck or jewel neckline. Check the length with your dress to make sure that it does not get lost and make sure there is not a lot of decoration on your dress. Opera: This is a long single strand that falls below your chest. You definitely need a slim style dress with this length, but it can be worn wrapped around your neck a few times for another great look. The Opera length is also great for wearing backwards if you have a plunging back and a high cut neckline. An amazing statement piece! 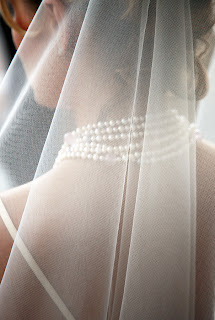 By pairing your pearls to your dress and neckline, you will find the classic bridal look that you have longed for. Enjoy finding the perfect piece for your special day! There are so many different types of gemstones and each one of them may require a different type of cleaning and care. We have been looking at many different types of settings and gems to help you keep your jewelry looking top notch and in brand new condition. Today we are talking about Inlaid Gemstones. When it comes to jewelry with beautiful inlaid gemstones you primarily see this beautiful inlaid work in Southwestern Style Jewelry. Often times this type of jewelry has inlaid turquoise, blue lapis, coral, mother of pearl, malachite or other various gemstones that are popular in Native American style jewelry. When cleaning inlaid jewelry you never want to use harsh or abrasive chemical cleaners. In addition, you never want to submerge those jewelry pieces in water. To clean your pieces you simply want to use a damp cotton cloth and gently rub the cloth over and around the inlaid gemstones. You will want to use a separate cotton cloth to dry them. Most Southwestern and Native American style jewelry is set into beautiful sterling silver metal so your metal jewelry setting will need to be cleaned with a soft anti-tarnish polishing cloth Other than that you should not use other cleaning agents on this type of jewelry. The handcrafted work on inlaid jewelry is amazing so to make sure that you show off your jewelry pieces in the best way, keeping them clean and cared for should be a priority. Safe keeping for pieces like this would include a lined jewelry box or a velvet bag so that they are not scratched or damaged by other jewelry. Beautiful Inlaid Jewelry is a treat to be worn. Caring for your pieces is simple and should be done each time you wear them for long lasing results! by Jasmine Yesak, Contributing Editor at ChasingTreasure.com, online retailer of quality jewelry boxes, jewelry organizers and watch boxes. Jasmine is a Jewelry Enthusiast and Organization Consultant, she writes about Jewelry Care and Jewelry Storage Tips. Jewelry is such a fun accessory. There are so many different things you can do with it and you can change a look just by wearing a different piece of jewelry or even by wearing the jewelry in a different way. A popular piece of jewelry is the bracelet. It is simple in concept, but amazing in terms of what you can do with one. It remains a highly enjoyed item and a favorite of many. Here are a few ways you can incorporate the bracelet into your Holiday look. This is a hot trend this season, especially in the icy hot white gold or sterling silver metals. You want to look for bracelets that have multiple tassels dangling down the bracelet or multiple tear drop shaped crystals, gemstones or tear drop shaped metal charms. You don't want to wear your tassel bracelet to have the vintage look, like something your grandmother wore..you want the classy and modern style tassel bracelet. They come in beautiful colors are you are going to love piling them on! If you really want to update your bracelet wardrobe this season, go out an purchase a few of the new trendy flexible coil wrap bracelets in a variety of metals and materials. We have seen them made with wood, metal and plastic beads or discs. If choosing an all metal coil wrap bracelet, try selecting one in the popular two-tone or tri-tone metal combinations. These look awesome with the winter clothing colors. They are comfortable, funky and fun. So depending on your mood, you can really change your style depending on which one you choose. You don't have to spend a lot of money when updating your accessories this Holiday season. Look for some great trendy bracelets and have fun showing off your creative style that is all your own! The November birthstone is the beautiful Citrine. The name Citrine comes from the French word "Citrin", meaning lemon and the name certainly suits this beautiful yellow/golden gemstone. The Citrine is a member of the quartz family of stones and is one of the "rarer" colored quartzes. Most people are familiar with the purple quartz which is commonly called Amethyst. If you are not fond of the Citrine don't worry...there is an alternate birthstone for the month of November and the alternate stone is the yellow Topaz which is just as beautiful as the Citrine. The only draw back when it comes to purchasing yellow Topaz jewelry is that it is a little more expensive than jewelry made with Citrine. If you are looking for a birthday gift for someone born during the November month a beautiful gift would be a nice piece of Citrine jewelry. The Citrine can also be given as an anniversary gift during the 13th and 17th anniversaries. You can find beautiful earrings, necklaces, pendants, pins, bracelets, rings, anklets and even watches with gemstone bracelet bands made with the beautiful gemstone. 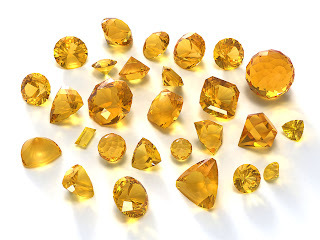 For the most part Citrine gemstones are faceted before placing them into jewelry pieces and you can find them in a variety of shapes and carat sizes. Just about every jewelry store or department store that carries jewelry will have Citrine jewelry on display for you to purchase. You can find inexpensive pieces set in sterling silver and them more expensive pieces set in gold or platinum. If you are a November baby, chances are you have some of this lovely gemstone and if not, maybe it is something that you can put on your wish list. Semi precious stones such as the Topaz and the Citrine are admired by many and they look beautiful in any setting. Heirloom jewelry chests are often handed down through generations. 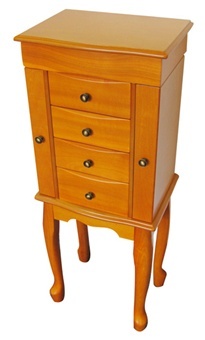 For example, classic wooden chests designed to hold an entire collection of jewelry are usually given to women by their fiances, husbands, mothers, mother-in-laws, sons or daughters and then they pass the jewelry chest down through family generations; from mother to daughter or grandmother to granddaughter and so on. When shopping for an heirloom jewelry chest, you'll most likely want to select one that is partially handcrafted and made to last through years of every day use. Fine jewelry boxes worthy to be called heirloom jewelry chests are crafted either exclusively from solid woods such as Ash, Poplar, Mahogany Maple or Teak, or from quality wood composites with rare wood veneers such as Burlwood, Bubinga, Ebony or Sapeli. Both choices of wood styles will be well constructed with beautiful finishes. The best quality heirloom jewel chests are constructed as 6 sided boxes with the lids and drawers cut from the same piece of wood. The same pieces are kept together throughout the manufacturing process to allow matched grains and even finishes. Solid wood tops, recessed bottoms and drawers with mitered corners give the jewelry chest all the qualities of fine furniture.Linings are hand fitted and tailored to cover all the jewelry storage areas of each chest, allowing the jewelry stored inside to be cushioned and protected at all times. There are many beautiful handcrafted jewelry chests for you to consider. Here are a few that are constructed from solid wood and carefully stained in a rich finishes. The finishes are hand-rubbed to reveal the natural luster and distinctive grain of the hardwood. Each of these boxes will hold a full collection of jewelry and come with a free engraved nameplate for personalization. Engraved nameplates can be personalized with initials, monogram, name or message up to 28 letters. 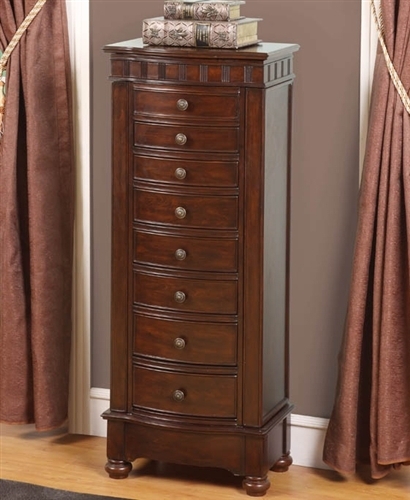 Our heirloom quality solid wood jewelry box armoire is fit for royalty. Crafted from American hardwoods and finished in Mahogany satin, this jewelry box will take your breath away. 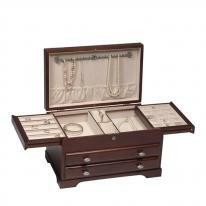 Our unique sapele wood high gloss jewelry chest will cause you to pause and admire its breath taking beauty. Constructed from one of the most beautiful woods available, Sapele (from the mahogany family) and finished with a luxurious high gloss, this jewelry box is the ultimate in heirloom beauty and quality. Jewelry Storage Features: Two removable, slide out jewel trays with ample storage for rings and earrings. Fifty five (55) Earring cards designed for post or stud earrings are also removable to allow for more storage beneath. Two open wells under the trays are perfect for large bracelets and two watch pillows in center. Lid features two necklace bars designed to secure twenty large necklaces or beaded strands with ten additional necklace hooks for finer chains. Drawers are lined and divided for earrings, pendants etc. Stunning beauty, a jewlsafe lock and generous jewelry storage make this jewelry box an absolute favorite and a perfect gift! Personalize this heirloom jewelry box with a free engraved nameplate. Length: 15 5/8" x Width: 9 1/2" x Height: 9 1/2"
Selecting anniversary jewelry gifts can be simple with these great ideas for your milestone anniversary. If you need help making a big impression, here is a list of anniversaries for years 15-25 along with gemstone and jewelry suggestions to celebrate your special event. For your fifteenth anniversary it is traditional to present one another with a piece of jewelry that contains a beautiful red ruby. 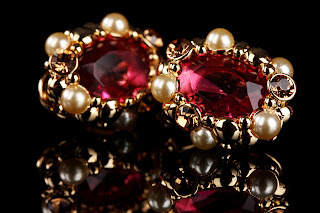 The ruby has been prized for hundreds of hears by royalties and non-royalty alike. If you are purchasing a gift for your husband, a purchase of a beautiful gold or platinum ring with a ruby stone would look great. You can find them both faceted or in cabochon form. A wonderful gift for the wife would be a lovely pair of ruby stud earrings, a nice ring set in gold or a ruby tennis bracelet. On your twentieth anniversary it is traditional to present one another with a piece of jewelry that contains a beautiful green emerald and that piece of jewelry would be perfect set in platinum which is the modern gift for the twentieth wedding anniversary. If you can't afford a platinum piece of jewelry then you can always select your gift in a white gold setting. If you are purchasing a gift for your husband you can find beautiful rings, cuff links and tie pins that have emerald stones set in them. If you are the husband you can purchase your wife a beautiful emerald pendant, a nice ring set in platinum or white gold, or a nice emerald tennis bracelet. Beautiful decorative pins make a stunning gift as well. For your twenty-fifth anniversary it is traditional to present one another with a piece of jewelry that is made from sterling silver which is one of the most affordable jewelry-making metals. You can find a large variety of jewelry set in sterling silver such as earrings, rings, bracelets, pendants, neck chains, ankle bracelets, and/or watches. You can make your anniversary a special occasion with a lovely piece of jewelry to mark the event. Enjoy spoiling your partner with an amazing gift on your next big anniversary. Here is a summary of traditional and modern wedding gifts for anniversaries 15-25. Most couples celebrate all of their wedding anniversaries but there are certain anniversaries that couples really like to "go big" on the celebration and gifts that they present to one another. Here is a list of special milestone anniversaries for years 1-10 along with gemstone and jewelry suggestions to celebrate your special event. 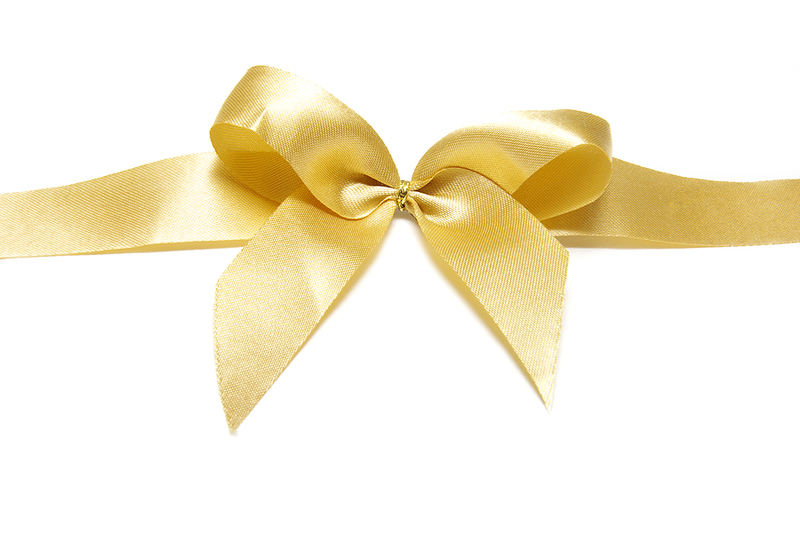 For your first anniversary it is traditional to present one another with a piece of gold jewelry. Traditional purchases for the wife are a nice pair of gold earrings, a gold pendant or bracelet as a gift that she will cherish for years to come. Gifts for the husband are usually a nice gold neck chain or bracelet if he wears men's jewelry. For your third anniversary the gemstone of choice is the pearl. Surprise your wife with a lovely pair of pearl stud earrings or a unique freshwater pearl bracelet. The modern gift for this anniversary is crystal so it's the perfect occasion to enclose your jewelry gift in a gorgeous crystal trinket box. Pearls for men aren't common and fortunately this anniversary has an alternate gemstone of Jade. Jade is striking when set into rings or cuff links styled for men. The traditional gift for the third anniversary is leather, making it the perfect anniversary to give him a leather valet box to hold his watches and jewelry. For your fifth anniversary it is traditional to present one another with a piece of jewelry that contains the beautiful blue sapphire gemstone. 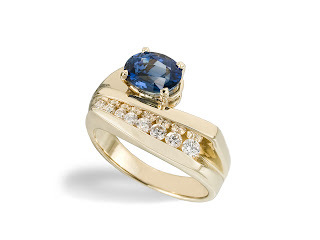 A beautiful gift for your husband would be to purchase a band ring with a sapphire cabochon set into it and present it to him in a keepsake box. If you are the husband, you can purchase your wife a nice pair of sapphire earrings, ring or beautiful pendant to hand from her favorite neck chain. The fifth anniversary is traditionally considered the "wood" anniversary, so this is the perfect occasion to present your gifts in fine wood jewelry presentation cases or to buy matching jewelry boxes and jewelry valets for each other. On your tenth anniversary a traditional jewelry selection would be to present one another with a piece of jewelry that contains a faceted diamond. Although traditionally diamonds are clear, the popularity of colored diamonds for the past decade also makes those acceptable gifts to give as meaningful anniversary gifts too. If you are purchasing a 10th anniversary diamond jewelry gift for your husband, a thoughtful choice would be to purchase a nice watch with diamonds set around the face of the watch or you can purchase diamond cuff links or tie pins. If you are the husband, traditional selections for your wife are a nice diamond tennis bracelet, anniversary band, or a pair of diamond stud earrings. You can make your anniversary gifts special by following some of the guidelines for jewelry purchases celebrating your milestones. The selections are plentiful and unique and the impact will be wonderful! Here is a summary of traditional wedding gifts for anniversaries 1-10. Learning about interesting stones is a great way to expand into different types of jewelry that is unique and beautiful. Today we are going to talk about a lovely stone. Ametrine is a natural quartz gemstone that is half Amethyst and half Citrine, hence the name Ametrine. The majority of this gemstone is imported to the United States from Bolivia with small amounts also being imported from Brazil and India. Ametrine pendants, rings, earrings and bracelets can be found in stores that carry more of the exotic or rarer types of gemstone jewelry. You can find this beautiful gemstone set in sterling silver, stainless steel, gold and/or platinum. The gemstone is half purple, half yellow/gold and quite beautiful to the naked eye. It is a semi precious gemstone so it does need to be handled with care. When storing Ametrine jewelry you always want to make sure it's stored in a protected or lined jewelry box with no other jewelry pieces laying on top of it to prevent scratches or damage from occurring. To clean the gemstone itself you just want to gently buff it with a clean, soft, cotton cloth in a small circular motion. To clean the metal around your gemstone you also want to use a clean cotton cloth made for jewelry cleaning. If the stone is set in sterling silver you can use an anti tarnish jewelry cleaning cloth to polish the sterling silver setting. You should never let harsh chemicals such as cleaning products; bath & body products or hair care products come into contact with your gemstone jewelry. If this accidentally occurs you should use a damp cotton cloth to clean your jewelry and then a second dry cloth to dry your jewelry pieces off. Make sure to take care to never submerge your gemstone jewelry in water! It can change the appearance of the stone permanently. Next time you are in the mood for a new piece of jewelry or you are buying a gift, take a look at the beauty of Ametrine and spoil that someone special! Even the simplest accessories can make a big difference in your style and make a big impact to the outfit you are wearing. Earrings are a great choice for making a statement. What's amazing about earrings is that they come in so many choices that you can have tons of them in your jewelry box and yet still want more to achieve that perfect look for your wardrobe. There is always a new trend lending itself to update your outfits with little effort or investment. What a great reason to go shopping for more earrings! * Look for two-tone and tri-colored metal geometric earrings. Try yellow gold mixed with white gold as well as yellow gold, white gold and rose gold all mixed together. * If you really want to make a unique statement with gold geometric earrings, go for solid rose gold, green gold or chocolate gold. These "gold colors" will cost you a little more but colored gold is all of the rage this season. They are flattering and look awesome looking too! * Look for earrings that mix shapes together. You'll find squares, ovals, rounds and tear drop shapes in layered dangle style earrings. Often the biggest shape is on top and then the medium shape and the smaller/skinnier shapes dangle beneath it. However they are stacked, it's a great look! If you are looking for a new way of expressing your style and for something that is definitely out of the ordinary, take a look at these cool Geometric and mixed metal earrings. They are a perfect choice to spice up dark fall colors and make a great statement. If you're looking for a high-quality leather jewelry box or travel case, you'll want to check out the selection we carry by Morelle & Co. In business for over ten years, Morelle manufacturers innovative luxury leather jewelry boxes for quality conscious shoppers. Their expertise in the business and talent for listening to customer preferences results in the fine products we carry in our store. From sleek travel jewelry clutches to huge jewelry collectors jewel trunks, you can expect expert craftsmanship, creative, classy designs and innovative features when you select a Morelle jewelry case. These well-designed leather jewelry boxes boast rich character, enduring quality, and eye catching colors. Each of the designs make great gifts for yourself or your loved ones. With the holidays fast approaching, take a look at these amazing jewelry boxes and shop early to be sure you are able to get the styles and colors you want before they sell out. We are proud to offer two new designs for 2012 featuring the clever addition of LED interior lights. Strategically located above the mirrors, this innovative feature is unique to these two select styles. The first style featuring LED lights is crafted in a favorite train case design with a convenient carry handle. You'll find ample jewelry storage for necklaces in the lid behind the mirror and in the two swing out sides. Rings are right at home in padded ring rolls. Bracelets lay nicely in the drawers and earrings can be organized into individual compartments and storage sections in the drawers. Includes a bonus mini travel case. The second style featuring LED lights is a huge black leather jewelry trunk with room for a significant amount of jewelry. 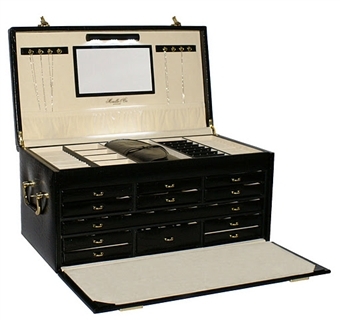 Styled for men or women, this collector's jewelry trunk is designed to hold fine jewelry in all sizes and styles. Chains can be hung in the lid. Pierced earrings have their own individual organizers to keep them paired together. Rings fit into the ring rolls. Sixteen separate drawers are home to bracelets, brooches, pendants, rings and earrings. This amazing jewelry trunk is styled to hold a lifetime of jewelry. 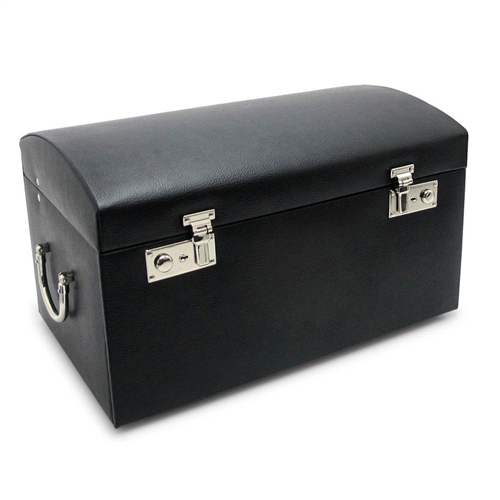 Length: 21" x Width: 11 1/4" x Height: 10"
If you love the style of our huge jewelry trunk but are looking for something a bit more compact, you will like our mid sized luxury leather jewelry trunk. It is crafted in the same trunk design, suitable for men or women's jewelry. It also has tons of jewelry storage. Earring organizers keep earrings from getting lost, jewelry storage sections keep chains tangle free and seven drawers organize rings, bracelets, brooches and pendants. The most interesting feature of this jewelry trunk is the three takeaway travel cases! Your travel jewelry needs for short trips and long vacations will be taken care of with one or all 3 cases. Length: 18" x Width: 8" x Height: 10"
When your jewelry storage needs are covered and you are shopping specifically for travel jewelry cases, one of these will fill your need perfectly! Luxuriously lined and crafted to the highest standards, Morelle jewelry purses, cases, clutches and folders keep jewelry safe while traveling. If someone on your gift list vacations or travels for business, a travel jewelry case makes a thoughtful and appreciated gift. 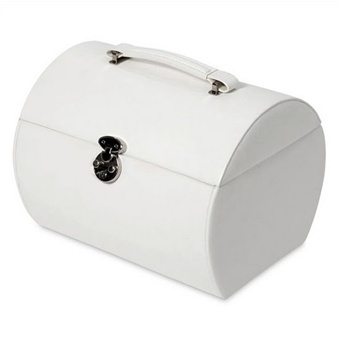 A classic white leather jewelry case can be hard to find and this one not only features a classic clean white exterior, it has a surprisingly spacious interior and unique fold out design. Designed for traveling or for home storage, it features a carry handle, secure clasp and well organized jewelry storage. 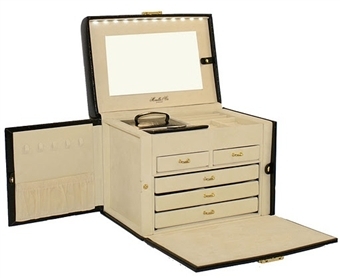 Two drawers, twin drop down sides, divided sections and luxurious lining keep your jewelry safe and organized inside. Length: 10" x Width: 7 1/4" x Height: 8"
Looking for classic white in something a bit smaller? 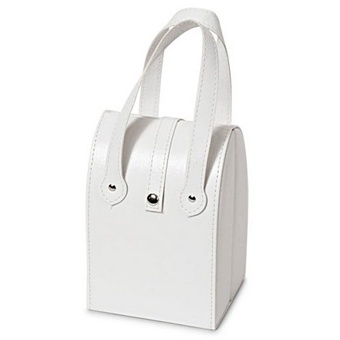 Our petite white leather jewelry purse is the answer. It has a refined sense of elegance with two top handles. 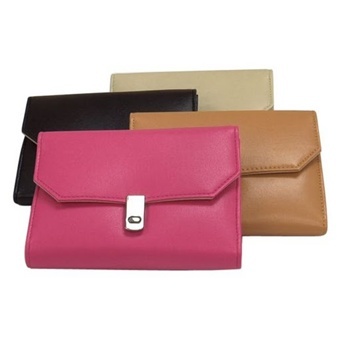 A handy leather tab opens to reveal twin storage areas for necklaces, bracelets and other jewelry accessories. 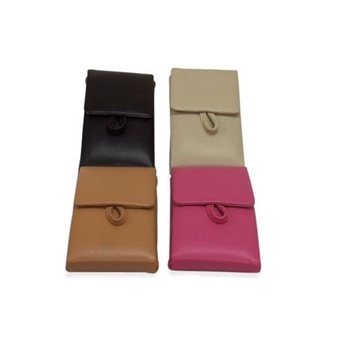 Two leather tabs are designed to hold earrings and chains in place while traveling and a soft rich chocolate brown velvet interior cushions and protects your favorite jewels. Length: 4 1/4" x Width: 7" x Height: 6 1/4"
When color suits your style, you can't go wrong with one of these gorgeous travel jewelry cases. 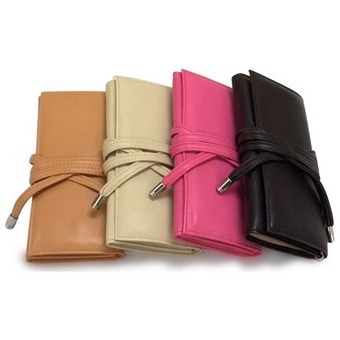 Each is offered in four color choices: black, tan, beige or hot pink. Choose the color that suits you best! Crafted of soft fine leather and luxuriously lined, each design features specific jewelry organizers for keeping earrings, bracelets, chains, rings and necklaces secure while traveling. Styled to slip easily into a purse, carry on or suitcase, these jewel cases make great gifts and perfect travel companions! If you're looking for a quality fine leather jewelry train case, trunk or travel clutch, we recommend these featured jewel cases designed by Morelle. And, with the purchase of each Morelle leather jewelry box you'll receive a FREE silver necklace! Click here to shop all jewelry cases by Morelle. October has two birthstones, Opal and Pink Tourmaline. The traditional October Birthstone is the Opal which many people refer to as a rainbow gemstone since many colors are reflected in a good-quality opal stone. The stone is a non-crystallized silica which is a mineral found near the earth's surface. It is a soft stone, formed when layers of the silica combined with water were deposited into the cracks and cavities of bedrock. It contains varying amounts of water within it that determines the appearance. This beautiful Opal gemstone is highly prized by collectors and can often be found in the crowns and jewelry collections of royalties. Most of the opals that are of jewelry-making quality are mined from the beautiful country of Australia. This gemstone can contain up to 30% water so it is a delicate stone that must be protected at all times from extreme heat, extreme cold and from water. You should remove all opal jewelry before showering, bathing and/or swimming. If you accidentally get your opal jewelry wet you should remove it as soon as possible and towel it dry with a soft cloth. In addition, you want to keep harsh chemicals away from all opal jewelry so do not apply cosmetics, perfumes, body products or hair products while wearing your jewelry. Store your lovely pieces in beautiful lined jewelry boxes for safekeeping. Opals are usually set into lovely settings of gold and silver and you can find beautiful color variations from blue to brown and even black. All of these colors have the most gorgeous color variations combined in the stone so you can wear your opals with any type and color outfit. Most Opals are set into rings and drop pendants, but you can find a lovely selection of watches and amazing necklaces too. Another favorite are dangle earrings. Many times jewelers will set the opals with diamonds surrounding the stone for an elegant and regal look. If you are not a fan of opal jewelry, October has an alternate birthstone which is the Pink Tourmaline. This too is a beautiful stone that you can wear in many different ways. On a scientific note, when heated, this gem takes on a static electric charge and it can attract light weight objects giving it a seemingly magical property. Once considered the "stone of the muse" it was believed to inspire creativity in the wearer. Pink varieties of Tourmaline range from pastel pink to ruby red and are mined in Brazil, Afghanistan, Burma, and India. If you are an October birthday girl, select beautiful Opal or Pink Tourmaline jewelry pieces and wear them with pride! Your wedding day is quickly approaching and one of your most important tasks is to select the jewelry you will be wearing on your special wedding day and this includes what your groom will be wearing. While some men really go all out with their jewelry, other men prefer to keep it simple and classic. No matter what your style is, it is important to match or coordinate your pieces so that all of your jewelry flows together. 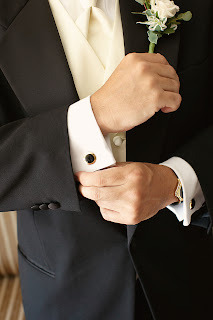 If you have chosen a yellow gold or white gold wedding band for your groom, then his cuff links, necklace, tie tack, watch and bracelet, if he is wearing all of those, should be all in the same metal as the color of the wedding band. In other words, don't wear a white gold wedding band with yellow gold cuff links and other jewelry pieces. If he is going for the classic "clean and simple" look then just wearing his new wedding band and cuff links will suffice. If you want to jazz up your jewelry selection for a more sophisticated flashy look then have him wear his new wedding band, a bracelet or watch, gemstone ring on his right hand, cuff links and even a tie tack to all match or coordinate with one another. Many brides and grooms choose to have their jewelry match as much as possible and many will select sets of rings. This, of course, is a personal choice and matching your other pieces that you are wearing should be relatively easy if you stay within the same metal colors and simplistic design choices. How much jewelry you wear on your wedding day is really up to you and your groom but for the most part men tend to keep it simple in the choices that they wear. Selecting the perfect jewelry for your groom is definitely something that he needs to be on board with since he will be wearing it. But by matching your wedding day jewelry selections with your groom, you will find a lot of beautiful choices and you will both look amazing. In our series about the care and cleaning of certain gemstones, we have been learning a bit about the unique properties of each stone and how to care for it so it retains its luster and beauty. Today we are going to talk a bit about the gem Agate. 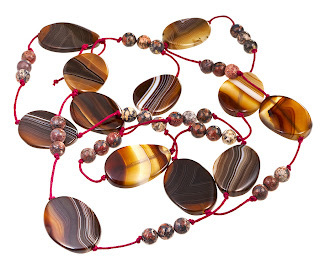 So, what is Agate? Agate is a micro crystalline variety of silica and is often found near volcanic rocks, although it can be found in other areas. There are many different types of agate depending on the region and area that is has been found. This is a beautiful gemstone that comes in various colors like royal blue, emerald green, ruby red, bright yellow, bright white and burnished rust to name just a few. This stone has been beloved for many years by jewelry lovers because of the bright colors that this gem has created as it was evolving. Agate is often used in the art and jewelry-making industry because it is very versatile and easy to work with. You can find it in jewelry pieces as a polished cabochon or as a carved piece (like an animal, cameo or flower). It is rare to find faceted agate stones in jewelry pieces because of the qualities of the stone. Since they are a porous stone you do not want to get the wet while bathing, showering, swimming, washing your hands or cleaning. To clean Agate, use two soft cloths with one of then dampened slightly with tap water and then immediately dry with the second cloth. Your settings can be cleaned with a separate cleaner meant for the particular metal but take care not to get any commercial or homemade cleaners on the stone itself. Store your Agate jewelry in a lined jewelry box to keep it perfect and you will be getting compliments on this lovely gemstone for years to come. There are some fabulous gems that nature creates and with a bit of human intervention, we have an amazing stone that we can set into jewelry and enjoy for years. Black Onyx is one of those gemstones. Black Onyx is an opaque gemstone created from a mineral called Chalcedony which is a crystalline form of silica that produces agate and many other types of mineral gemstones. Onyx is a variant of agate with black and white banding. Black Onyx is a popular stone that is often set into sterling silver and stainless steel jewelry, although you can find it set into gold and platinum too. You often find Onyx created into a pendant style cut called cabochon or beads. It has been used for centuries in cameo jewelry and other fine carvings. It is polished to a fine luster and is dramatically beautiful. Before cleaning your Black Onyx pieces know that the onyx gemstone has a very porous surface so you should never use chemical cleaning products or water to clean your onyx jewelry because water and cleaning agents can discolor your stone forever...a process that can never be reversed. To clean any jewelry containing an onyx stone you will need two soft cotton cloths or small microfiber cleaning cloths. You will slightly dampen one of them to wipe the debris and dirt off your stone and then immediately dry it off with a second cloth. If the metal portions of your jewelry are dirty and need to be cleaned, we recommend that you use a special jeweler's cleaning cloth to clean just the metal portions of your jewelry pieces. You should not bathe, shower, swim, wash your hands or clean your house while wearing jewelry made with onyx. If you happen to get your jewelry wet by accident it is important to follow the steps listed above to clean it right away as you want to remove any chemicals immediately. It is a rather hard mineral so it can scratch other jewelry pieces. Storing it in a separate jewelry case or sectioned compartment is recommended to preserve all of your jewelry. It can be challenging to find a jewelry box designed to hold chunky bangle bracelets. 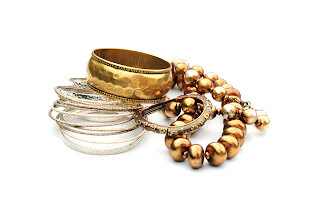 With bangles growing in popularity you may find yourself wondering how and where to store them. When looking for a jewelry box that will have room for bangles, the most important factor to consider is the width and depth of drawers and jewelry storage sections. Most bangles need storage space of 3 1/2 - 4" accross and at least 2" deep. Many jewelry boxes are designed with a drawer depth of 1 3/4" so the best jewelry boxes for bangle bracelet storage are designed with a lift out tray for smaller items and open undivided storage underneath, perfect for laying out your bangles. Two lift-out trays that rest on their own support ledges. Small top tray spans half the jewelry box and has 3 open sections. Full sized lower tray has two large open sections and a generous ring roll section. Ample open storage in bottom compartment - perfect for bangle bracelets! Length 14", Width 9", Height 8"
Ample open storage in bottom compartment - fits chunky bangle bracelets! Removable divided tray with open storage underneath for large jewelry items like bangles! Length 11" x Width: 6 1/2" x Height: 5"
For more jewelry box choices, look for other styles with open undivided jewelry storage and compartments with a depth of at least 2". Type "open storage" into our search box for more jewelry box choices to store your bangles in style! The colors are beginning to change and with the season changes outside, we find color changes in our jewelry and fashion too. One winning way to spice up a favorite outfit is with jewelry. What's fun this season? Bangle bracelets! Going into the fall season, bangle bracelets continue to be hot and trendy! They are a super simple way to dress up or dress down an outfit and really let your individuality shine through. Bangle bracelets are thick, thin or somewhere in between and stack nicely on your arm. You can mix and match the color and textures to impart your own uniqueness. This fall we are seeing beautiful colors in different metals and gemstones in earthy browns, greens and blues. You can find great animal print bangles and chunky wooden bangles that mix and match wonderfully. Big and bold is a fun look and compliments this falls earthy shades of clothes perfectly. When it comes to genuine gold and sterling silver bangles, they look beautiful when you purchase a few with varying designs, shapes and widths and layer them up! Beautiful diamond or crystal bracelets are so lovely too and really can add some sparkle and shine. Also add in a lovely watch to the mix and you have a personal style that is delicate and classic. Remember to watch how you care for your different types of bangles that you have and store them in a lovely lined bracelet box or jewelry chest to keep them from scuffing each other. Each type of bracelet we talked about has a different cleaning method, so be aware of the materials your bangles are made from and take good care of them. You'll receive pay back with a lifetime of lovely bangles that will stand the test of time. Most men wear a traditional band as their choice of wedding jewelry but much has changed in men's jewelry designs to give you and your new husband many unique choices. For centuries men have been give little selection when it comes to their wedding band. Typically available is the familiar classic white gold; yellow gold; platinum or sterling silver band that can be plain or engraved rings but this has been changing for the past decade or so. Today men want something a little fancier when it comes to the jewelry they wear on their wedding day and for the rest of their life. They are looking for choices that are manly yet have some style and reflect their personality too. Many couples even look for matching styles to further reflect their commitment. Here are a few style for men that are classic yet stylish too. Style #1: A mix of colors on the traditional styled wedding band. This creates an interesting two-tone effect and many men are selecting white gold mixed with yellow gold or black titanium mixed with icy white platinum. White gold mixed with yellow gold presents a contemporary twist on the classic choice. The latter presents a tuxedo-look which is quite contemporary and unique. Style #2: Men's wedding bands can come with a little bit of bling! We have seen men sporting around wedding bands that have channel set diamonds or channel set diamonds and gemstones. Most men are conservative with their bling and choose to stay under the 1 carat gemstone weight but there are plenty of options. Style# 3: Wedding bands that have geometric designs on them are hot this season! You will see men selecting engraved or molded geometric designs on their wedding bands. You can find these types of bands an every variety of metals available. Many guys have 2 different wedding bands that they opt to wear; one plain band for working or sports and one specialty band for all other times. This makes sense for those guys that work with their hands and play sports in case of damage or loss. But remember, when not in use, make sure that the wedding bands are secured in a fully lined jewelry case or men's valet box so that they are not lost or damaged. Malachite is a copper carbonate mineral and comes in a beautiful shade of deep green. Malachite has been mined all over the world but the main source of Malachite comes from Russia and the Urals. Here in the United States you will find Malachite being mined from the great state of Arizona. On the gemstone hardness scale, Malachite ranks in at the 3 /12 to 4 level on hardness so it is considered a semi-delicate stone that needs to be properly cared for and protected so that it doesn't become damaged. Here are a few tips for caring for your beautiful Malachite jewelry pieces. Because of the fact that Malachite is a rather delicate stone, it does have special cleaning requirements. Normally, it can be cleaned with a gentle commercial jewelry cleaner or a homemade jewelry cleaner that is mild. Once you have cleaned your Malachite jewelry it is important to always towel dry your pieces with a soft cotton cloth. Do not store your gems wet. Malachite jewelry is usually readily available in fine jewelry stores and you will often find this beautiful gem set into sterling silver. 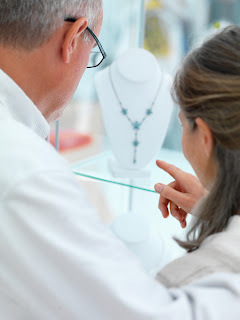 If you like it set into different metals; you can usually find some in gold, platinum and even stainless steel depending on the type of jewelry pieces you are seeking. As with other delicate jewelry pieces, when it comes to storing your Malachite stone jewelry, they should be placed in a lined jewelry box and not stacked onto other pieces of jewelry. You do not want to ruin your fine gemstones with careless storage. Next time you are looking for a unique and beautiful natural gemstone, consider Malachite jewelry and with these easy care tips, your jewelry and you will look stunning. With the changing seasons, it is great fun to change your look with jewelry. There are many interesting new jewelry trends that will look awesome with the fabulous styles arriving for Fall. One of my favorites is filigree style jewelry and it's coming back! Bold jewelry is a significant trend for Fall 2011, specifically big, bold filigree style jewelry. What's filigree you ask? We are talking about jewelry that has numerous swirls and details patterned into the construction and design of the jewelry piece. Filigree jewelry is bursting with personality and style. We are seeing it featured on the runway as well as seeing it showcased by Hollywood and New York celebrities wearing it with day and evening fashions. When it comes to filigree style jewelry, you want to look for pieces that are big and bold, that show of the beautiful details and workmanship. The best pieces to work into your fall wardrobe are solid color pieces in great earth tones of tans, beiges, greens, browns, ivory and black. You can find dangle earrings, over-sized pendants, rings and chunky bangle bracelets made from a variety of materials such as gold, silver, platinum, stainless steel etc. The designs feature semi precious gemstones, faux ivory, enamel, shells and wood. The selections are huge! 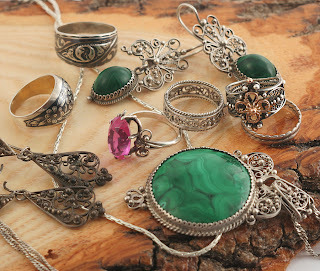 Filigree jewelry looks amazing with many different types of clothes from slim leggings and an oversize sweater to a lovely dress or slacks outfit. Regardless of how you want to dress it up or down, you will look amazing sporting beautiful, bold filigree jewelry. And it looks great on anyone too. There is not a body type that cannot wear this type of beautiful jewelry. Make sure to wipe it off and store it properly in your favorite jewelry box after you finish wearing it each time so you can enjoy your jewelry pieces for many months and years. Grab yourself some gorgeous, bold filigree jewelry so you can add the finishing touch to your favorite new clothes this fall. One of the best ways to store a large collection of jewelry and accessories is a spacious floor standing jewelry box. 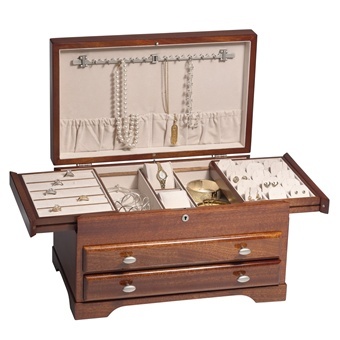 Wooden jewelry armoires allow you to organize your jewelry collection in a convenient, elegant and secure manner. Since jewelry is such a popular gift among engaged and married couples, jewelry boxes and jewelry armoires are popular wedding and anniversary gifts. What better way to show her you enjoy giving her beautiful jewelry to wear, than to give her a beautiful jewelry cabinet with plenty of room to grow her jewelry collection? If you want to understand how a floor standing jewelry box can fit into wedding and anniversary gift giving, the best way is to examine the features of some of the popular models that are offered by the top manufacturers in this field. I'd like to begin with the traditional oak-finished jewelry armoire offered by Mele. Measuring-in with a length of 13 inches and a width of 10 inches and a height of 34 inches, this is an elegant piece of oak furniture that features a lid with interior mirror, a top compartment with central ring roll section flanked by six open sections, four open drawers, and dual necklace doors that house six hooks each, plus catch panels. It's scalloped front apron and Cabriolet legs are beautiful and the hand-lined ivory suede fabric interior give it a luxurious feel. This is a mid sized jewelry armoire and houses both fine and fashion jewelry quite nicely. 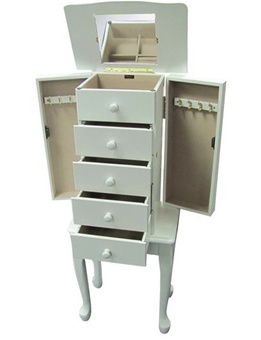 If you going to store a very large collection of jewelry and accessories and want to acquire a high end floor standing jewelry box then you may be interested in our large jewelry box cabinet with eight curved drawers by Nathan Direct. It features a handsome five step finish and is available in two colors (coffee and antique beige). This classy and spacious armoire has eight large felt lined drawers and two full length side doors with double rows of hooks for necklaces and longer chains. The top flips open to reveal a vanity mirror and smaller compartments that are perfect for displaying rings, brooches, earrings and other jewelry accessories. The top is even designed to double as a charging station for cell phones and ipods. In case you are wondering how it would fit in your bedroom, this cabinet has a length of 16 inches, a width of 10 1 2/ inches and a height of 40 1/2 inches. 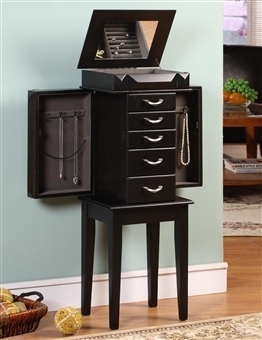 A new and very popular model is our black jewelry armoire with modern details. For the woman with contemporary style, this jewelry armoire will be a good fit. Standing 37 inches tall and measuring 13 3/4 inches across and 10 1/4 inches deep, this up to the minute jewelry armoire rests on sleek modern legs and features angled wood details with brushed nickel hardware to finish it off in contemporary elegance. 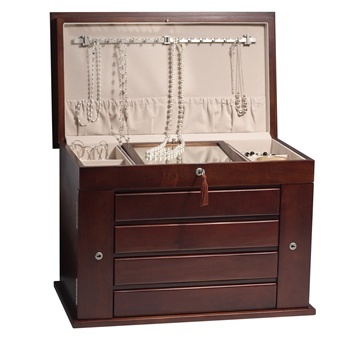 Generous jewelry storage features include six drawers, a divided jewelry section under the mirrored lid, complete with a generous section of ring rolls, and twin swing out necklace sides with three large hooks per side. For the woman with classic or cottage decor, our white French Provincial style floor standing jewelry armoire is a good choice. It is crafted in a slim, space saving design. When you lift the lid, you find an interior mirror. The top compartment features one ring roll section and two open sections. Below the top compartment are four more drawers and these are flanked on the left and right with necklace doors, each having double hooks. The interior has a plus hand-lined suede fabric. The cabinet rests on Cabriolet legs and measures 14 1/2 inches long, 9 1/4 inches wide and is 37 1/4 inches tall. These are four examples of what you will find when looking for floor standing jewelry boxes and cabinets. In addition to making wonderful wedding and anniversary gifts, they are a great investment for your own collection. Some of the popular models are often out of stock due to demand, so if you are gift shopping, buy well in advance of your gift occasion. by Karen Mollison. Karen is the Editor of ChasingTreasure.com, where you can buy high quality jewelry boxes, jewelry cases and jewelry armoires.